Yoga training at one of the Moscow clubs. Yoga is catching on in the Russian capital and increasing numbers of people are looking for places to perform their yogic stretches. Some popular places in Moscow are highlighted below. If you think yoga is all calming relaxation, Ashtanga practice will come as a bit of a shock. A modern form of classical Indian yoga, Ashtanga involves swift, aerobic transitions between various yoga positions. You'll find yourself longing for the final pose "Shavasana" or "corpse pose," where you lie flat on your back, relax into the floor and feel like you might never have the strength to get up again. 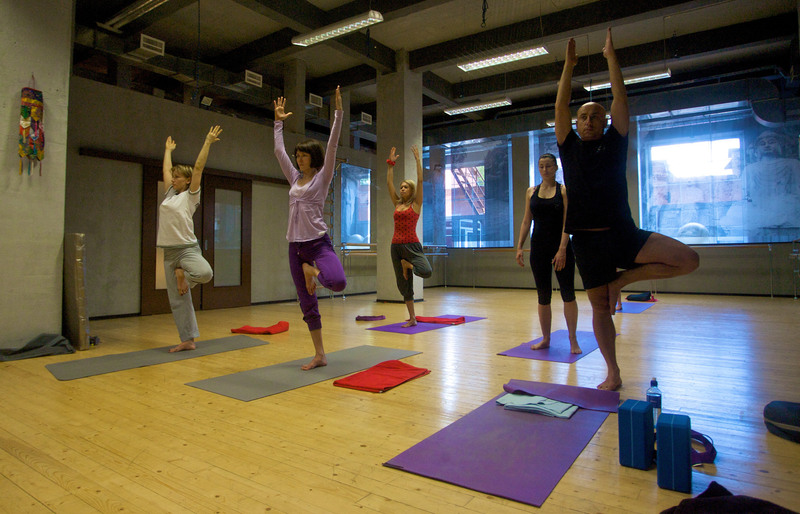 Moscow's Ashtanga school has two studios in prime locations near Mayakovskaya and Teatralnaya. Drop-in classes are 700 rubles, while an eight-class pass for the month is 4,100 rubles. Some teachers speak English so inquire when you book. Prana Yoga gathers the best teachers from different yogic practices under one roof and lets you choose your preferred style. The organization's 55 daily yoga classes across two studios mean you're spoiled for choice. With a one-off lesson costing just 400 rubles or a "first steps in yoga course" offering 3 lessons for just 1,000 rubles, there is no better place for beginners to test the waters. If you're more experienced, you can opt for a subscription. Eight morning lessons over one month will cost 2,700 rubles. A massive bonus at the Timiryazevskoye branch is the on-site sauna, the perfect guilt-free way to treat oneself after working up a sweat. Yoga 108 focuses on developing the strength and stamina of students through Hatha yoga practice; which is otherwise known as standard yoga. Classes are intense and will certainly push you, but the expert teachers are used to working with yogis of all levels so you needn't feel embarrassed about the state of your downward dog. Classes are held in Russian, but if you let the centre know your language preferences when you book your lesson, they can ensure you attend a class where the teacher can speak at least some English. Eight lessons over 30 days cost just 3,600 rubles or a one-off class for you and a group costs 3,000 rubles. There's no excuse not to grab some friends, squeeze into those yoga pants and limber up. Energy Yoga is another studio specializing in Bikram yoga practice. Their stylish — if rather orange — studio is specially equipped to ensure the right levels of oxygen for optimum yoga practice. The centre is equipped out with modern, convenient facilities, and on Fridays they hold a special "happy Friday class" for the bargain price of 350 rubles. It's not quite as fun as a conventional happy hour of course, but it's certainly a lot healthier for you. Alternatively, if you want to take things a bit more seriously, unlimited classes for one month cost 4,050 rubles for the first month. This goes up to 4,500 rubles after the introductory offer. As the name would suggest, Bikram Yoga MSK specializes in Bikram yoga. That is to say, 90 minute classes where you repeat the same series of 26 postures in a room heated to a steamy 40 degrees Celsius. If that sounds — quite literally — like your idea of hell, just think of the health benefits. Sweating rids your body of toxins while the heat gives you a more intense workout and can aid chronic pains like arthritis and backache. Bikram Yoga MSK offers a number of packages, including unlimited sessions from 7,000 rubles per month or a one-off session for 900 rubles. While classes are taught in Russian, many of the teachers either speak some English or are patient enough to break things down for you if you get your ‘asanas’ (poses) in a muddle.